Are you free this summer to change even more lives? We're looking for amazing people to volunteer at one of our summer events! Join us as a volunteer at Big Church Day Out and receive free entry, a daily food allowance and camping accommodation including a tent and airbed. We’ll also be at Soul Survivor, Momentum and !Audacious and are looking for volunteers to help run our Compassion stand at each of these events. To volunteer for any of our summer events, email hilarys@compassionuk.org for more information or to register your interest. In other event news, we’re delighted to announce that for the first time, we'll be at Focus 2016 in the New Forest. 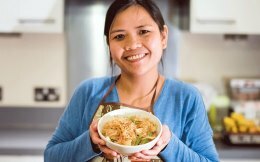 And this Saturday, Compassion graduate Rose will also be at Creationfest in Cornwall cooking Pancit Bihon. Click here for her delicious recipe!